Anyone with elderly parents will know the anguish and strain of looking after them from a distance. Most value their independence, and this can be a worry for dutiful sons or daughters trying to care for them. This was exactly the problem for Jackie Chapman, and her husband Arthur, of Winslow, Bucks. When Jackie’s war veteran father Maurice (83) became ill, it was clear that he and her mum Freda (79) needed some help. Arthur, says, “We felt it was right to provide a secure home for both of them closer to us.” The Chapmans live in Buckinghamshire. on a 1 ⁄4 acre site. They toyed with the idea of building on or constructing a Granny Annex but Jackie’s parents now live in a spacious and comfortable log home in the garden, literally on Jackie and Arthur’s doorstep. The log bungalow, constructed from solid three inch thick spruce logs, nestles in its own patch of landscaped ground facing hedgerows and open fields beyond. It has had a little tweaking to provide the facilities Jackie’s father needs. “He uses a walking frame so it was essential that he had enough space to get around independently”, says Jackie. 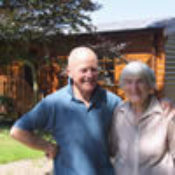 Maurice and Freda’s specially adapted log home has a large and airy open plan sitting room and kitchen, double bedroom, spacious shower room, utility room and airing cupboard. “We made sure the living area was big enough for Dad to move around easily”, says Jackie. “The cabin provides a perfect solution for us’, says Arthur. “Jackie’s parents still enjoy doing their own thing and are completely self-contained and are able to look after themselves. They love the practical help we can offer being so close to hand.” he says. Maurice and Freda regularly entertain their friends in their new home which is the envy of many. The logs provide a high level of insulation, keeping the house cool in summer and warm and cosy in winter. “It costs us well below £500 a year for lighting and heating’, says Freda. Planning permission was sought for the 28ft by 19.5ft log cabin. “We consulted our immediate neighbours first and they gave us a letter of support for our application so the planning came through without a problem,” says Arthur.